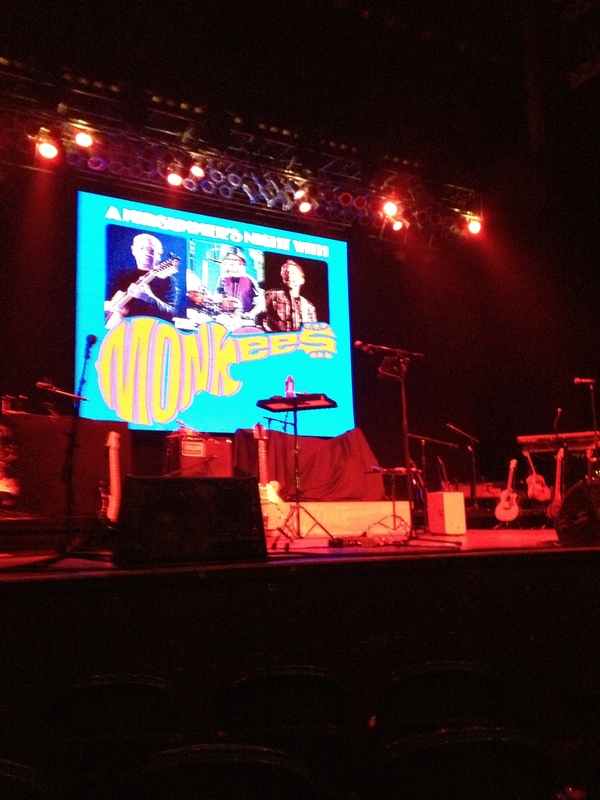 Here let me set down a tale of what I am almost certain will be my last Monkees concert ever. It’s long, but I think in part that’s because, while I’m ready to move on from the intense interest I’ve had in the guys over the past year, part of me still doesn’t want this dreamlike season of my life to end. You see that pic at the top of the post? That was our view from our seats. It was even better than the Nez show in Ferndale, for all that we were about 20 feet away rather than a yard or two. There was no iPad block, and our seats actually had seats (though we used them for maybe a quarter of the show max). The line of sight thing worked surprisingly well the other way, as you’ll find out in a moment. 😉 One note before we get into the review–given that 90% of the set list is identical to last year, I emphasized new stuff and songs from the 2012 tour that changed substantially due to their performance or my perspective. If I don’t talk about something go check out my Cleveland review—I decided my previous assessment still stands. I need to go looking for the new video “Overture” on Youtube–Andrew made a genius move as we see The Big Victor flipping channels between the Brady Bunch, Mad Men, Johnny Cash, Breaking Bad and David Letterman, et al. The entrance in darkness was similar to last year, with similar applause ratios (to be expected, since I’m pretty sure this was the first time Nez has toured Oklahoma in any way since the Johnson administration). After I got my very Okie “Oh my Holy God!”s out of the way as the precise awesomeness of our seats sunk in, we bopped along to Last train to Clarksville, and cheered at the intros. Even from the first songs, we could tell that the band had gotten MUCH more solid since last fall–and they weren’t exactly shabby in Cleveland! And then Michael Nesmith opened his mouth. Now, I’d been to Ferndale, so I knew his voice had gotten stronger since last fall. However, in the last 8 months the man had FINALLY committed all the lyrics of his own songs to memory–I think he only goofed one or two all night. Oh yeah–toward the end of Papa Gene’s Blues Micky appeared to smack Peter on the bum, and my insane (in a good way) friends over at Naked Persimmon sensed a Great Disturbance in the Force. My husband, being possessed of a a few Auntie Grizelda-esque relatives himself, enjoyed himself thoroughly as Peter sashayed his way across the stage as only he can. As I saw Kevin lip syncing with a broad grin, my worries subsided about whether he would enjoy something that was so much “my thing”. I knew he was gonna have a GREAT evening. The Kind of Girl I could Love was a hard-charging new addition to the first set, and as they progressed through She and Sweet Young Thing, I noticed one of the smart changes they made from last fall. I could tell that the band was doing more of the heavy lifting for the guys, adding more layers of sound and leaving them free to focus on highlight stuff like Peter’s tasty banjo solo and the spinning microphone humor in She. The guys even called Wayne Avers down to the front of the stage for a few spotlight moments throughout the show, which was a more than nice touch. 4th wall piercing Number 1:Attentive concertgoers or listeners to the audio (which I will be sending over to the inimitable Iain Lee as soon as i get it split into tracks) will notice that Micky very briefly got the giggles during Stepping Stone. I think that one was the fault of Cin’s husband Steve, who was wearing his traditional Monkees Concert Tee shirt. Micky was over on our side of the stage, Cin gestured over to her husband, he looked, and well… sorry, Micky! (except not 😉 ) In any case, as the first set drew to a close, we all bathed in the utter Monkee Glee that permeated the Brady Theater. You Told Me and Sunny Girlfriend unfolded in a similar vein to Cleveland (save that the Blonde behaved herself). It was lovely to nestle next to Kevin during You Just May be the One–he certainly was and is mine, and I hope I was for him. 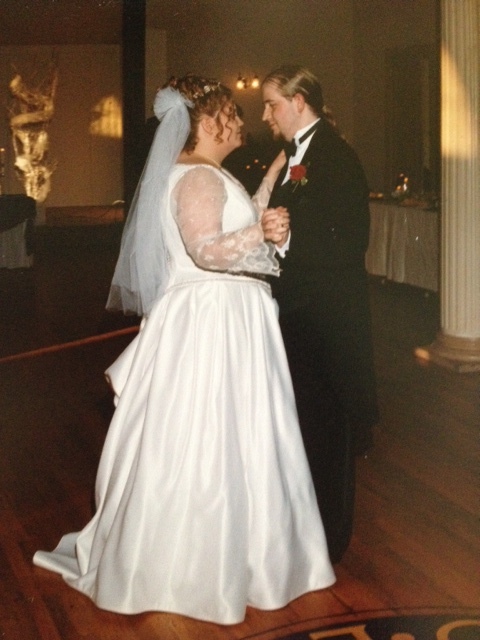 It’s been 15 years and I’ve yet to run him off, so that’s a good sign. Then came Mary Mary, followed by The Girl that I knew Somewhere--another song that ran in my head often in the early days of our relationship, as we learned to trust each other after some ill-advised previous entanglements (Fortunately we had a happier ending). Next in this transition-less streak of rapid fire songs was Early Morning Blues and Greens–this summer just Peter on a stool. I got my wish from the last concert, and this one was on the newest Shoe Suede Blues Album Step by Step! Go forth and buy, kids. No offense to Davy, but Peter OWNS this song now. I’ll break out Mighty Morphing Power Rangers and the Collected works of Jacques Derrida later when I have a few hours to devote to deep textual analysis. I’ve no doubt these are yet more of the intricately evocative metaphorical lyrics we have come to expect from the man–or maybe it’s just that he’s a Chevy guy? Interlude: The Colors, The Colors! What quickly proved itself to be the “Frodis interlude” (Both clips from the caper of that name and memorable second season moments where one or more Monkees were most clearly under the influence of said herb) went over a treat with the audience. At this point I started paying more attention to the editing of the clips–what they chose to leave in and what they cut out. There’s enough video in the can of these guys that one can re-edit it to tell a wide variety of stories about this band. This interlude was all about the genuine camaraderie that shone through the hackneyed classic plots and purple haze, and we lapped it up with a great deal of knowing laughter. * All that said, Where was Princess Gwen?! And then the band kicked back in with the intro I’d been keeping my finders crossed about since Houston. I slammed my iphone over into video mode (the resultant 1-2 second skip in my audio on either side of the song from my later splicing was worth it), centered Nez in the frame, and then I ignored my screen for the next 3 minutes as I stared directly at him. The rest of the universe evaporated, as a song that subconsciously informed many of my 20-something struggles of self-definition played out. Even before The Year of our WTF brought me back to the fandom, The Door into Summer was one of a handful that remained in my playlists through the 2000s as I set the fandom and Camille aside, broke free of the golden handcuffs of corporate life, grew up a bit, and generally tried to figure out who I was and how I could achieve all the things I thought I needed to achieve in order to be “good enough”. Watching Nez sing, I resonated deeply with his delivery–it was straightforward and almost blunt in an odd sort of way. The lyrics still might have been in the third person, but unlike in Pisces, Aquarius, Capricorn, and Jones, he no longer sounded a bit like one of the sophomoric children who left king Midas there, smug in the certainty that the young generation would lead much more fulfilling lives than their forebears. Great though the song is on its own merits, Nez’s deliberately vulnerable position and awkward body language takes it to a completely different level. Long story short (because I could probably do a thousand words on this song and the old and new renditions of it), I think this is Michael Nesmith’s Early Morning Blues and Greens. That said, I’ll let you watch my video and be the judge. Words was great, but anything was going to be a bit anticlimactic after the previous number. As for Tapioca Tundra–after a year of writing these essays/reflections/musings/whatever the hell they are, I think I get what Nez was saying a little better now. In some ways the story told in Fandom Lenses isn’t just a part of me anymore, after hearing from so many people who have resonated with it. That said, the process of sharing all of the stories and thoughts seen here wasn’t simply one of subtraction, as I gained something wonderful in in return in the form of your appreciation and even a few new friendships. By sharing my thoughts, and hearing yours in return, we all gain something–in much the same way that Nez said the other day that our joy makes him happier and younger. All this has me thinking of other things, probably non-blog things, in which I can employ this intriguing form of alchemy where the whole equals more than the sum of its parts. The Head intro was condensed substantially–just a commercial, “Ditty Diego”, and then a very carefully executed hard cut onto one of the largest suspended arch bridges in the world. The Head content almost read like a solo set of sorts, as with the exception of Circle Sky, each Monkee was on stage alone for their spotlight songs–Not only did it make for a nice breather, it also echoed Davy’s solo turn on the stage (well, the video screen) in a very lovely way. The picture doesn’t do justice to the staging of the beginning of the Head set, as Micky came out alone on the dark stage about the time his younger self leapt off the bridge. 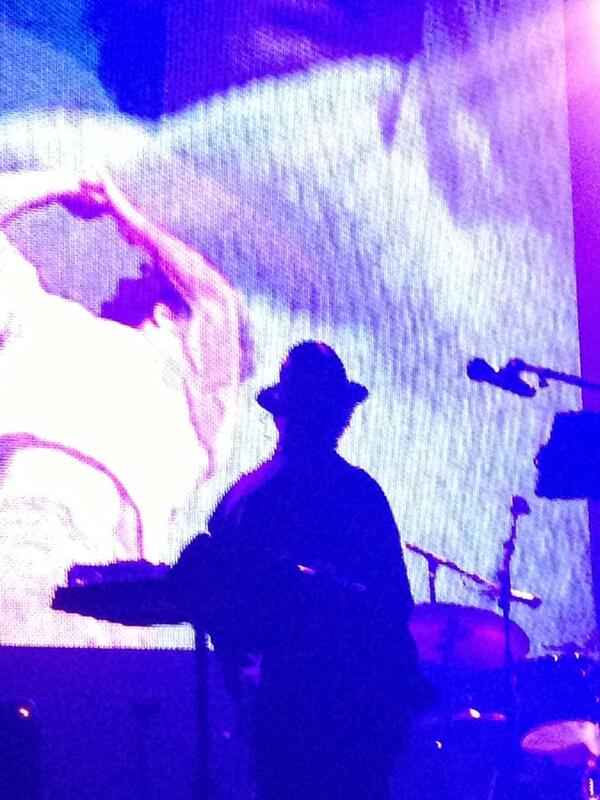 in silhouette he watched his plummet unfold, then started into Porpoise Song, well-executed as always. I didn’t know this was about to happen in Cleveland, but yet another layer of recursive meaning had accrued on this song since November. Back in 1997 I was playing this track on my Discman (remember those?) 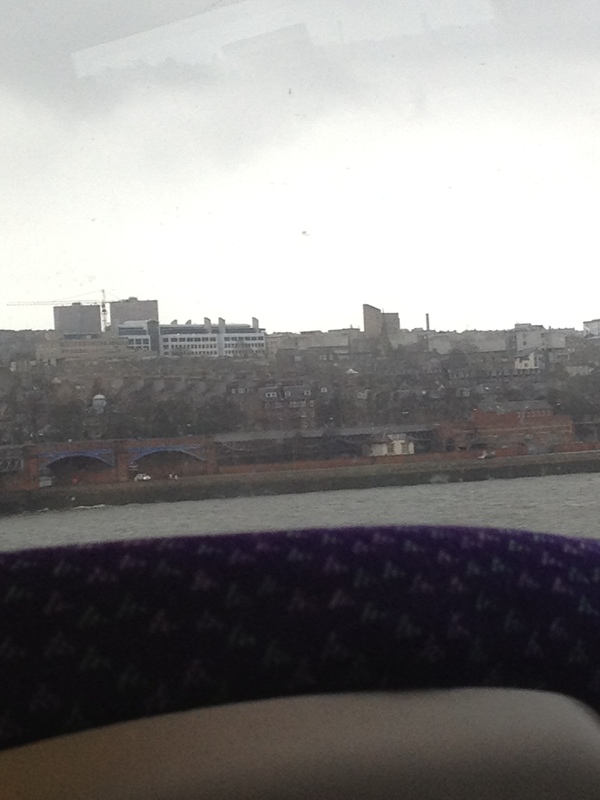 as the train pulled out from Dundee station and slowly crossed the Tay Rail Bridge at the end of my year abroad, as a goodbye to a city where I’d found an old beloved band and new inner strength. I pulled the same stunt again on my iPhone this March, as I nodded to the recursion and cued up the 2012 live version as the train swept me away at the end of a long-promised day in Dundee with my husband. A bit of me could feel the chill in the wind from that day as I listened and realized that in that moment, I had begun to say goodbye to another pivotal era in my life. The farewell tour had led me through Manchester, Ferndale, and then culminated as I sat between my husband and my best fandom friend in the 4th row of the Brady. “When you see the end in sight the beginning may arrive!”–indeed. Oh yeah–then we had Long Title and Daddy’s Song. Both lovely as always, but Kevin and I were still on Planet Gleeb for a bit there. I did note that they went with recorded audio instead of the live band on the latter–smart call. I read on one discussion board that the band considered that the hardest song of the night in 2012 simply due to video synchronization issues. I looked up at his face, as he beamed and sang and danced with all his might. I grinned, shrugged, and joined in with my own somewhat shaky boogaloo. 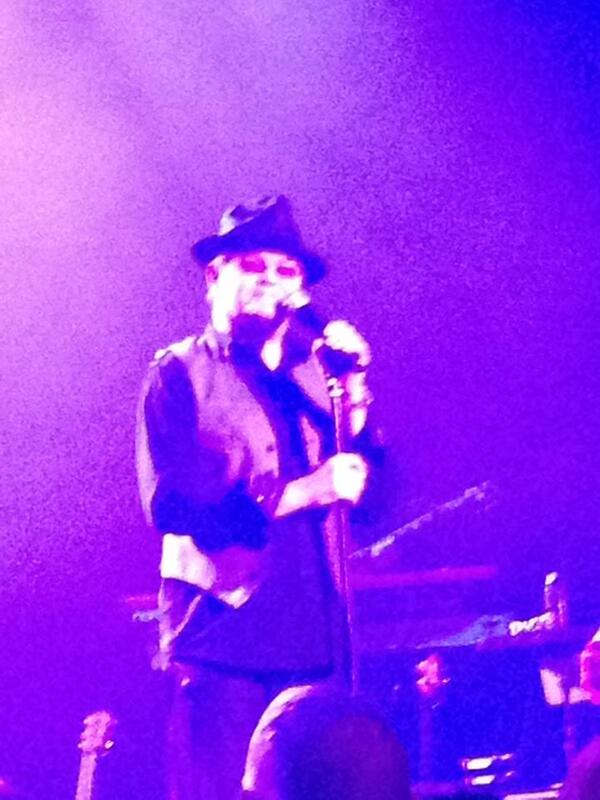 😉 The Monkees is magical indeed. Then, Nez launched into the closing number of the main show, What am I Doing Hangin’ Round? His vocals were much stronger than in Cleveland as we all just kept on singing along right through the end of the show, and their bows. Disclaimer (11/18): An interview has been brought to my attention that calls my interpretation into question. That said, while my conclusion may turn out to be wrong in fact, I know what I sensed. I still stand by the general themes of what I wrote even if they’re still touring in another decade. Consider everything that’s transpired. Whether your best laid plans included zero, one, or a dozen more joint projects, if you were in their shoes wouldn’t YOU approach every show as if it might be the last? You see, until I went, I just assumed that the title of this summer’s tour was simply a nod to the season. However, after the show as I thought more about the past 45 years, not to mention the last 18 months, I wondered if the title was possibly a somewhat more deliberate shoutout to shakespeare’s play-within-a-fairy tale. Whatever connections they might or might not have been trying to make between the pre-fab four and the faerie folk, Nez, Micky, and Peter truly looked far more playful and joyous and, well, puckish than they had any right to be given everything they have survived and triumphed over. Their apparent happiness made me happy for them, and for myself. And at least according to Nez, our joy brings them joy. I keep trying to figure a way that this night might not be my goodbye to the Monkees–I was wrong in Cleveland after all. However, this tour feels like a last lingering encore–like the more carefree tour all four guys would and could and should have enjoyed last year had the events of February 2012 not occurred. I could sense the tone of farewell in Peter’s wistful delivery of Early Morning Blues and Greens, in Nez’s shattering rendition of The Door into Summer, and in Micky’s closing, haunting refrain at the end of Porpoise Song. Guys, if you read this, I want you to know it’s been an honor and a privilege to be your fan, and I will remain a fan for the rest of my life. I hope each of you will reach the end of this time together (plus hopefully a UK tour and maybe even an album if you’re so moved! ), part as friends, and then go do whatever the hell you want to do. As for me, I think I’ll be doing the other stuff described in my about page. I suspect my own future will involve far less time in Monkeedom, but it will also involve a lot more joy and silliness than it did before 2012. I wish you the same for your retirements, whether they play out on your back porch or in a RV tour bus. Let’s all go forth, make friends, and be happy in our own ways. * Yes, I am quite aware of all the bickering and dissension and headbutting that was also starting to take root in 68 and which by some reports ran clear through to 2012. However, A: as Christmas Eve puts it in Avenue Q, the more you love someone the more you want to kill them, and B: I think they’ve more than earned the right to tell this damn story the way they want to tell it. Categories: Davy Jones, Michael Nesmith, Micky Dolenz, Monkees, Peter Tork | Permalink. I’ve said before how I envy your ability to be aware during a concert; you’ve passed on some of your tricks, but once the music starts, I become a drift of seaweed in a surging tide. (The show I saw last week with cellomouse reinforced that tendency; afterwards she told me six or so different things that were going on around us that I never noticed.) I also envy and respect your contextual connection to the band and the music, and I deeply appreciate your willingness to lay these moments open for our enjoyment. I guess I should be happy for your contentment and cheerful resignation as you move forward and onward to other pleasures. I’ll make it an effort, for your sake, although I’m also glad you’ll leave a trailing line of interest long enough to be a part of the “Order of the Chickens” project. I’m not resigned to calling this round of shows any kind of ending. 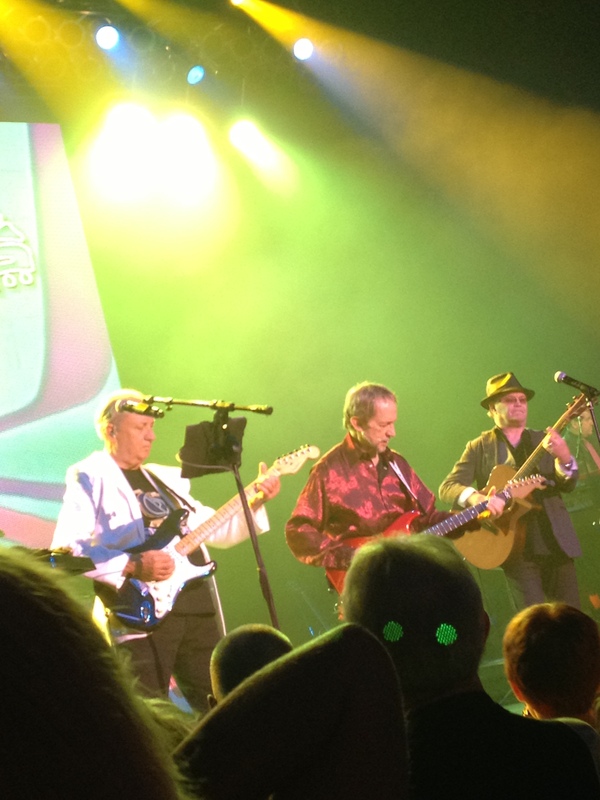 It may be the last time I ever see three Monkees on the stage together, but then, I came very late to the party at a time when the fandom was in official mourning. I am still basking in the Miracle of the Gazpacho, and would not presume to demand yet a further miracle. I abide in hope, however, that they guys may have found enough pleasure and energy and confidence and forbearance to take their show on the road next year to the UK, where the fans have been faithful and patient and remarkably uncomplaining. I remind myself from time to time that Shoe Suede Blues is where Peter’s heart is now. I’ve only seen “his” band perform once, and I boldly believe that I will see them again. He’s teaching me to appreciate the blues as I never thought I would. But even with this very current band there is a lesson about death and endings and renewals. I have to refer to YouTube to see Shoe Suede Blues in its earlier incarnation, before the sudden and untimely death of Richard Mikuls in 2008. But there is no power on heaven or on earth that could stop Peter from performing as long as he has breath, though we may someday need to take up a collection to buy enough gas to get the band’s van out of New England. Mike seems to be blooming. He has hinted that there are other blossoms growing in his garden, which may ultimately lure him out of the limelight and into the sunlight. If he does withdraw again from the public eye, I’ll be grateful for whatever time we have had with him. In the meantime, I’m hopeful for my friends in the American south, who are still waiting on tenterhooks for the announcement of his fall tour dates. Micky is a powerhouse and will continue to develop his performing career in as many directions as he can. I’d have thought I’d be somewhat less likely to seek him out in his non-Monkee performances, but then I did take my whole fan-damily to see him in Hairspray last winter, so who knows? Oh hon–I phrased my intro badly, to the point I revised it a bit. I am NOT leaving the fandom, I shudder to think of the epic level of poltergeist activity I’d get from Anissa and Davy if I tried. Further, even if the fandom dies one day, i will always be a fan–I was a lone fan long before the internet sprung up, and I’m 95% decided they’re gonna be playing Porpoise Song at my funeral. Nobody seemed too scandalized at the Monkees-heavy playlist at Anissa’s memorial, so there you go ;-). I’ve just got to dial back my facebooking and blogging and tumblr-ing for a while and for a lot of reasons–one of which being that i can devote more energy to getting your book fact checked! (Did all y’all you hear that Melanie’s gonna have a Monkees Episode guide coming out in the near future? watch this space for details!) Over 27 years I’ve learned that the guys themselves flow in and out of Monkee Business, and my rhythms in the fandom seem to usually echo theirs. I guess it’s just… in order to feel fulfilled, I need my life and work to be about more than just pop culture stuff–It’s sort of similar to Shoe Suede Blues or Micky’s broadway career or the 28,000 creative projects Nez has going. I want to impact the world (or at least my chunk of it) with my doctoral research, and I want to run a library that’s every bit as good as our hard working students deserve. Until I can figure a way to sneak into the Ministry of Magic and swipe a time-turner, that means I’m gonna have to make some hard choices about how much energy I give to which things. Thanks for sharing this warm and insightful review. I agree with your observations that there was a different vibe to this most recent tour; I thought it was because there more time had elapsed since Feb. 2012 and the sense of playfulness just came a little easier at this point. I hope it wasn’t truly their good-bye, but I know it very well might have been. I’ve really enjoyed your insights during the last year. None of my friends are Monkees fans on the same order as myself, so it’s been so much fun to find that I haven’t been alone out here. Thanks again. Thanks! I’ve not always been lucky to have “Monkees friends”, so ever since I found the online fandom in the mid 1990s, I’ve treasured them that much more. The vibe you and I noticed could even simply be them hedging their bets–after the 2011 tour and Davy’s death, they might just have decided to go out there in “Carpe Diem” mode for the next 10 years. So you are kinda saying you felt a sense of closure as their fan?? Just asking because so did I when I saw the 3 of them in Nov. I was a 13 yr old fan in the late 60’s and did see Mike, Micky and Davy in 1969 in Chicago. Then during the 80’s reunions and the show on tv again, it felt old news like a part of my past so I didn’t get directly involved in concert-going and what have you….but in 2001 I decided to see Micky, Davy and Peter in late March. Then I eventually got myself online and among other things found their fandom. Now my inner adolescent took hold of me lol in my 50’s and I saw Micky in Pippin as well as 2 solo shows, Peter solo once, and Davy solo. Meet n greets too! Then the 3 of them in 2011, a great show! After Davy’s passing 😦 and when Mike came back into the mix, I saw them in Chicago. Now it felt like closure because I first saw them there in my youth and with Mike LOL and after all this time here he is again…..I’ll always be a fan but it just felt as if I’d gone as far as I could go. No need to be as obsessive as I was there for a minute anymore LOLOL and so life goes on. I am saying that if the guys have already tacitly or explicitly decided to call it a day Monkee-wise after this tour or in the not-too-distant future (Say after a UK Tour and/or a final album), It would explain the vibe I felt Saturday night. I would not be surprised, and I would feel grateful for the way they brought this particular pop culture phenomenon to a close. I also feel that I have received MORE from these guys in the past year than I could have even imagined as a daydreaming kid, and far more than I have either earned or deserved. Seriously–I don’t see how you top this last year. I said this on Ttumblr and it bears repeating–I would rather them end this reunion sooner and happily rather than later and bitterly. Oh definitely, I too would rather see them go out happy than harbor any unkind thoughts about one another, as has happened in the past. Looks like they will do so, as the Nov dates came and went on a high note…and this time it looks the same, maybe even better, as all the videos posted seem to show them having a GREAT time! 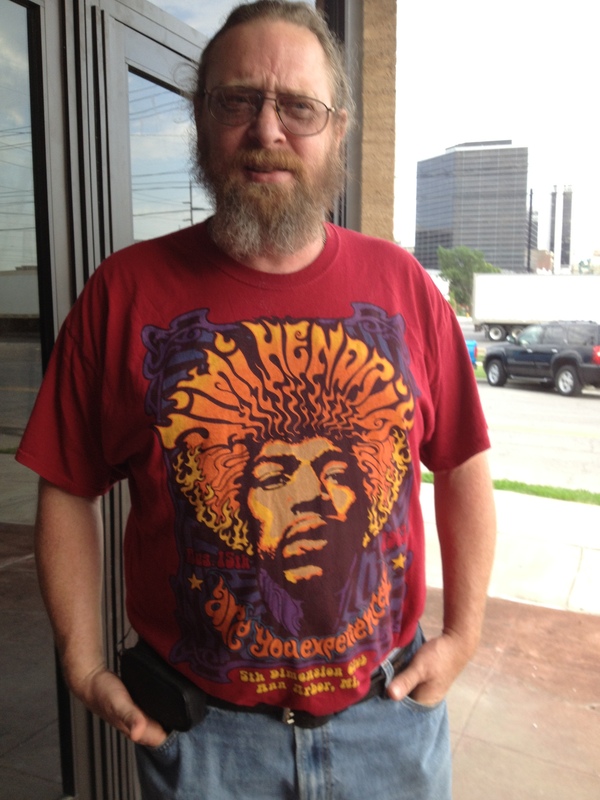 I love that Hendrix shirt. I love that this concert was such a unifying experience for you and your husband. And oddly, I love that Micky hit some woman in the face during Goin’ Down. I didn’t see that. You maintained a very keen awareness of what was happening during the concert, which I envy. Thankfully, people like you also have the smarts to record it, so people like me can go back and watch it and say, “Oh yeah! That did happen! !” And I’m in total agreement that the guys sounded even better than last year. We are such lucky people to have witnessed this. Really, really lucky. Well–I didn’t see the mike-bonk, Cin did (or at least thought she did? I think I read somewhere there might not have been fan-microphone contact?). in fact, Cin’s why I caught several things in the show. For instance, I was only peripherally aware there was anyone in the universe aside from Nez during Papa Gene’s Blues, but Cin nudged me just as the cuteness began to unfold on the other side of the stage. I’ve had several people compliment my skills of observation on these, which surprised me as I don’t think of myself as terribly observant. I think my PhD training in doing ethnographic observations and interviewing may have to do with it, plus the fact that my inner (?) ten year old would shoot me if I missed a microsecond of any of this. As for Kevin–he’s the unsung hero of the story told in this blog. He held me when I cried the night after we lost Anissa (and for a few nights after). He handled cat (er, Femme) herding duties in Bay City when the rest of us were about to pass out from Feels Overload. He has listened to more talk about Jimmy Fallon and Eric Lefcowitz than any sane man should be asked to endure. He is my lifemate, my best friend, and incorporates nearly all of the best traits of MY first 4 crushes. I am a lucky woman.